Over the last decade I have had the good fortune to lecture on track and field and distance running throughout Arnerica and the World. The topic of the day could be sports psychology, training theory or biomechanics but I always try to slip in a comment on the importance of the six foot drills. In many instances it may seem totally unrelated but if performance is one's ultimate goal, and if only one thing is remembered from the day's lecture - I hope it is the six foot drills. I got the idea for the foot drills from my study in East Germany in 1987. Quite honestly there was little value to that study tour. The East Germans seemed confused by our questions and their presentations were disjointed and generally pointless. They did show us one Super 8 film on foot drills for high jumpers. It didn't register at the time. I've subsequently studied several people's work, including Edgar Cayce, who have discussed the benefits and virtues of doing daily foot exercises for prevention of a multitude of foot and leg problems. In 1987 the six foot drills were integrated into my team's daily training plan and the grand experiment began. .
We did the six drills at the start of each practice. 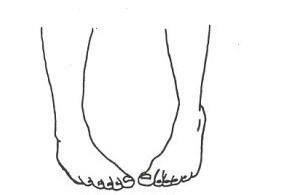 Five of the six drills are done in barefooted or stocking feet. The distance covered for each drill is about 25 meters. Each drill is done once daily. The walking is done at one's own pace. Total time for the drill with shoes off to shoes on is about four minutes, pretty simple. 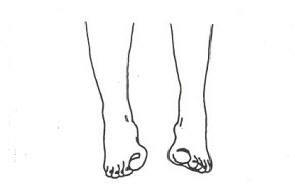 The six drills, illustrated below are to simply walk on the outside of the foot (invert the foot), walk on the inside of the foot (evert the foot), walk with a toe-in or pigeon-toed gait (adduct the foot), walk backwards on the toes, walk with the toes pointing out (a la Charlie Chaplin) and with the shoes back on, walk on the heels - this protects against bruising the heel. Done daily these six drills will eliminate shin splints, Achilles' tendinitis, plantar fasciitis, lessen the chance of a severe ankle sprain and virtually all knee problems. The famous Rice Study done in the early 90s found that 79% of running injuries are from the knee down. One of the reasons I had successful teams is that my athletes made it to the competition day healthy and ready to compete. Season after season was completed with virtually no injuries. It should be noted that there are three problems with the foot drills: they are simple, they are easy and they are free. It doesn't involve more than taking off one's shoes and putting one foot in front of the another. But that is easier said than done. Why do the foot drills work? There is very little muscle in the foot. This presents a problem because most of the balance and proprioceptive sense we get comes from our muscles. A second point is that the neuromuscular pathway (the communication line) from the brain to the foot is the longest and slowest in the body. This leads to bad, or at best, poor coordination of the foot. If you doubt that put a pen between your toes and try to write your name. The demands of athletic participation, be it running, jumping or quick starts and stops places tremendous stresses on the foot. 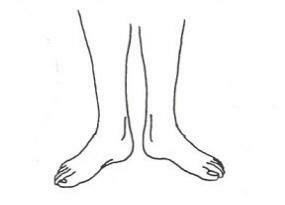 In fact the foot must sustain seven times the body's weight with simple running and up to 20x body weight in some jumping activities. Done repeatedly this is how an overuse syndrome such as shin splints, plantar fasciitis or Achilles' tendinitis develops. 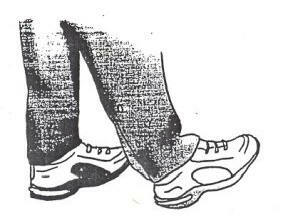 By challenging the foot with various gaits one develops a clearer pathway from the foot to the brain. Clearer pathways are faster and more responsive. This gives one better balance and proprioception. 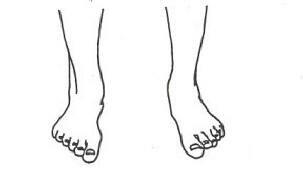 Each foot strike becomes more "sure," the foot contacts the ground without a wobble, however slight that wobble might be. It is because of this "sure foot stride" that the overuse syndromes (Achilles' tendinitis, plantar fasciitis or shin splints) are eliminated. It has been said that running is a ground contact sport. It is this repeated micro trauma of ground strike, repeated 1000s of times that can lead to injury. Other factors such as running surfaces and proper shoe selection can influence the incidence of injury. But I will contend, with a great deal of assurance, that the six foot drills, done consistently, will have a tremendous positive benefit on one's athletic participation and performance. Applying the simple, easy and free. The last note. The foot drills will also make you faster. I mentioned the slight "wobble" of each foot strike. More accurately described a wobble is lateral side to side motion. Speed is generally straight ahead. 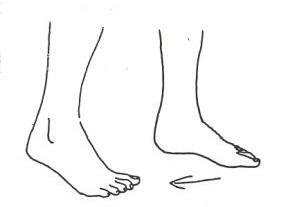 If, on each foot strike there is the wobble or lateral motion before there is the forward motion, there is lost time, not much, but some. If one's ground contact time can be reduced 1/100th of a second (it takes 14/100ths to blink an eye) the cumulative effect can drastically improve one's performance. Consider this - if one takes 50 steps in the 100m, 50 X 1/100th of a second = 50/100 of a second or 1/2 of a second. One-half second is the difference between the 9th place spectator and the Olympic Gold Medallist. In a mile this reduced ground contact time translates to an 8-10 second difference and in the 10K it means between 50-60 seconds. An improvement made in the blink of an eye, one step at a time. Simple, easy and free. Russ Ebbets, DC lectures extensively as a lead instructor for USA Track and Field and is the editor of Track Coach Magazine, the technical journal for USA Track and Field and the author of the novel Supernova, on the famed running program at Villanova. Copies are available for 10.95 plus 1.50 SS&H from PO Box 229, Union Springs, NY 13160.